Originally discovered in 1942 by American scientists who were trying to come up with good transparent gun sights during WWII, superglue is the “sticks to everything” goto adhesive for all your gluey quick-fix needs. Anyway, there’s probably a lot about superglue that you’ve never heard before. So, read on, and then you can go impress your friends with your amazing knowledge of cyanoacrylate adhesives! First of all, superglue refers to various types of cyanoacrylate (CA) adhesives. There are quite a few different kinds for specific applications. Superglue works by rapid polymerization in the presence of water – usually, humidity in the air. This trait also helps explain why superglue is so good at gluing people parts together, as the human body consists of a whole lot of water! You know how it goes: open new tube of superglue, use it once, and put the cap on carefully. One week later, you try to open the tube and find it’s all gluificated together – even if you made sure no glue was left in the applicator tip. So, you use a pin to poke a hole, etc. In short, superglue only has a shelf life of about 12 months – if you’re lucky – for UNopened tubes. The minute you open it, humidity gets into the tube, and it starts slowly polymerizing inside. Once opened, you’ll be lucky if the tube lasts a month. So, it’s pretty pointless to buy a big tube of superglue unless you’re going to use it all at once!! You can extend the shelf life of superglue by storing it in the fridge. Cold temperatures will slow the “self-gluing” a bit. Or, stick it in the freezer… Just make sure to allow the glue to warm to room temperature before opening it and using it. Otherwise, you’ll get even more condensation inside the tube, and it will shorten the 30-day Already Opened Limit. The thicker the layer, the less likely the polymerization process will result in a good bond. That’s why the liquidy superglue always works better than the gel variety (also, the gel type has additives). Obviously, try not to glue your own parts together. If you do, use acetone to dissolve even dried superglue. Incidentally, always have some acetone on hand. It’s great for dissolving superglue, expandy foam, and removing stickum from just about anything. If it’s sticky, acetone will remove it. Do not try to use superglue on cotton, wool, or leather. Using superglue on these natural materials will cause a potentially wild exothermic reaction. In normal people speak, that means heat – and possibly fire! Granted, you need to use a lot of superglue to start a fire like this, but it’s still good to know… especially if you’re stranded on an island with only cotton balls, a crate of superglue, and a bunch of raw bacon. Superglue also doesn’t work well on some other materials, especially glass. There are special superglues for glass, but in my experience they don’t work very well. Generally, superglue seems to work best on more porous materials, but not so well on very smooth surfaces. Note that at least with the baking soda + superglue trick, the reaction releases a bit of heat… Nothing to be terribly concerned about, but FYI. Arrows: Wanna know how they glue fletching to arrow shafts? 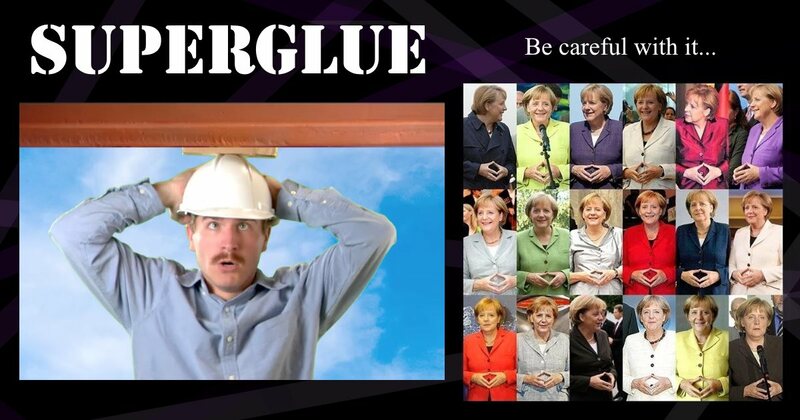 Superglue! Fingerprints: Heat some superglue, and the fumes produced will react with the water in the air and harden on fingerprints, making them visible. Probably don’t want to try this one at home, as the fumes are toxic and can irritate certain conditions like asthma. Nuts and bolts: Insert bolt, screw nut on the end, tighten. Then put a drop or two of superglue between the nut and the threads. Ta-da! Note that this does not permanently bond the nut and bolt – you can still use a wrench and unscrew the nut. But it does act as a kind of chemical lock washer. 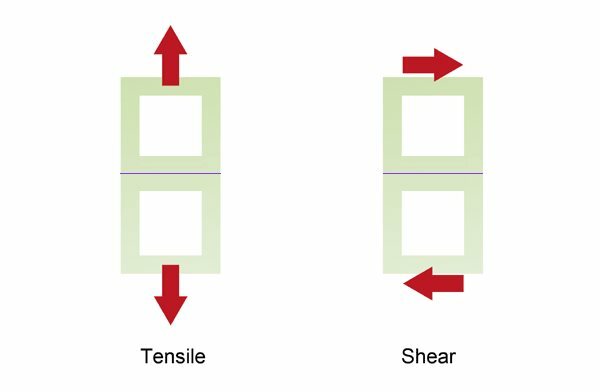 When two surfaces are superglued together, the tensile strength is rather high. In other words, it’s hard to pull the two surfaces directly apart after they’re glued. So, if you superglue two objects together, you’ll have a hard time pulling them apart. But if you shear them apart (sideways), it will be much easier to break the superglue bond. This also explains why you can superglue a nut to a bolt, and still remove it later: because turning the nut on the bolt threads is effectively a shearing stress. Many people say superglue is water-resistant, whereas others classify it as “weak” in terms of water-resistant adhesives. There are special superglues that are more water-resistant, which probably clears up some of the confusion: not all superglues are the same thing! But for true underwater repairs, there are much better, special-purpose adhesives one can use. Okay, this one you’ve probably heard about. BUT… It’s tricky. There are official medical superglues, and all of them are different than the superglue you can buy at the hardware store. In short, you CAN superglue small wounds together with the regular stuff. It works. 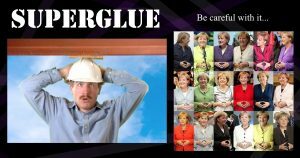 Just be advised that there are many different types of superglue, and the medical ones are different for a reason. One reason is patents, I’m sure… But another reason is skin irritation. Well, some superglues have been known to cause skin irritation – even chemical burns – for some people. Also, the fumes are nasty and can irritate conditions like asthma for some folks. If you superglue two objects together, under normal conditions they’ll stay stuck together for a loooong time. For things like superglued fingers, it’s really not the horror it appears to be. Fact is, human skin cells are continually shedding and growing, so your fingers would naturally come unstuck as your skin replaces itself. 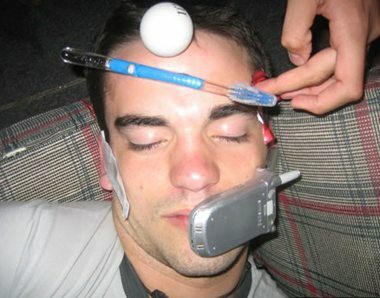 That’s why the guy in the above photo won’t have to spend the rest of his life with an old cell phone, toothbrush, and ping pong ball stuck to his face. Just don’t get superglue in your eyes! That’s bad, bad juju… Continually flush with water, and call the paramedics. This is one Superglued Parts case where you cannot treat it yourself. Have some superglue tricks and tips? Share in the comments below! I found another great use for super glue. When a rock hit your windshield and you get a star, if you drop super glue on the hole and and all the little burst cracks, the cracks will not continue to grow. The glue stops the cracks from growing out and making a long crack in the windshield. After the glue dries scrape off the surface residue with a razor blade so the glass is smooth. Good for splinters you can’t see, next dab some glue on, let it go hard and peel away. Drop filling nicks and dings in Guitar Finishes….especially Taylor Guitar’s. .it can be wet sanded smooth and Polished for an invisible repair. .. I am making a basket for a 60th Birthday party by gluing pop rocks to skewers with a sign that says 60 Rocks. I was wondering if the super glue would seep through the package that the pop rocks are in. Hmm, not sure… If the inside of the pop rocks packaging is plastic-lined, it should be okay. I haven’t had pop rocks in years, though! Can you bake things that have been superglued? Usually not. Some kind of epoxy resin would be better, but it depends on what kind you use, the materials being glued, etc. My technician broke my chiller tray while trying to remove it. He want to use superglue to stick it back. Depends on what it’s made of… But most commonly used plastics are not very superglue-friendly – especially if the glued joints will be exposed to temperature variations and/or humidity/water. Not particularly on super glue but on these other unbondable Plastics you are speaking of. I’m 56 years old and have worked in the automotive repair industry in different capacities all my life. I have come across numerous types of problematic Plastic repairs and deliberate modifications or customisations. I’ve used several different methods including hot air plastic welding, hot iron plastic welding and different bonding agents . I still had some problems though and started looking for technology or techniques I haven’t tried. After trying numerous products that claimed to be effective and permanent, I found a product through a company called Tech- Bond Solutions. And nope, I don’t work for them, I’m not associated with them and I’m not getting paid buy them to advertise. This is just factual information from my own personal results using it on things I either could not Bond or never had great success with. All I’ve got to say is look them up. Tech-bond solutions. I talked with a guy name Don. Don’t know his last name. Is it safe to glue, broken dentures, with crazy glue, it works great for several months, then you bite down on something hard, and they break in half again? Hmm… I’m not sure. I don’t know what dentures are made out of, but it sounds like it works fairly well – for awhile! I knew a guy who swore that blonde worked for his dentures soooo… maybe worth a try? How long do you leave them to dry for? My super glue bottle must have burst open cause the bottom of it is not securely stuck to my glass table and I cannot figure out how to get it off..Please help me!! Put a small amount of acetone on the base of the bottle/table. Let sit for a minute, then scrape off with a new flat razor blade scraper thingy. Can you repair a small crack in the top of a 12 volt battery with super glue and baking soda? Does it react with the battery acid? Baking soda would react with battery acid. Not sure if its used as a “binder” for the superglue, though. For that, I’d probably use epoxy resin and glue another piece over the crack. Not sure if that’s the best idea, but that’s what I’d do. Thanks, Scottie. The reaction of the baking soda had just dawned on me after writing this! Could Gorilla glue also work? Ya know, I’ve never actually used Gorilla Glue. I can’t even tell what kind of glue it is. It’s apparently a polyurethane glue, but also a cyanoacrylate… My chemistry knowledge fails me, I’m afraid! I am restoring an outdoor wooden storage bench and was told that the oiled wood on the bottom which has a few cracks that I wouldlike to seal – I can seal with CA glue or super glue (I need the gooey stuff not the liquid stuff because some of the cracks are at least an eighth of an inch) however I can’t find any information anywhere to see if the bond will stay tight after in winter when it freezes. Do you know if dried cured CA glue will crack in the winter? I know they do this like with baking soda + superglue for guitars and stuff, but that’s usually at a constant temp on an existing material that doesn’t expand/contract very much. Well, hmm… Not sure about heat. Looks like you’d need to heat it to at least 110C / 230F (and probably much higher). That’s pretty toasty for electronics even when they’re off. On the other hand, you could try acetone, but yikes… That might not play nicely with other parts of the phone. Acetone does a wonderful job discoloring and even dissolving certain plastics. I’m afraid that’s quite a pickle! Well, I THINK that in order to get it hot enough to weaken the superglue, you might risk damaging something. But then, I’ve never actually dealt with this particular problem before. Opening the phone can also be tricky, but there are literally tons of vids on YT about how to open phones of various makes/models. Every time somebody gives me their phone or laptop and says, “It’s not working!” I just hop on YT and get to see exactly where the screws and glues are. In the olden days, I’d just break things accidentally due to some “hidden” screw or clip or something. Today, the Oops Factor is much lower thanks to YT. I have to say that opening phones with adhesive is often kind of annoying. It never quite goes as easily as in the video. Maybe I’m just bad at it. Also, you have to be careful not to puncture the battery inside if it’s glued in place, which is more and more common these days with non-removable batteries. If you puncture a soft-case battery, it can cause a rapid discharge which will then possibly cause a small fire. So then you’d have a flaming phone with a superglued SIM card. YAY! That wouldn’t be so bad, because then you’d have a fun story to tell, and everyone would be terribly impressed that you even tried. Anyway, not to freak you out or anything, but just go slowly and carefully, just in case. Better safe than sorry. I would probably go for a vid to see the inside of your phone without taking it apart. If it looks like the sim card/slot will be easier to replace or unglue, then go for the disassembly option. You could then either try the acetone option or the desoldering. Yes, thank goodness for YouTube!! I did nails for year’s you know the ones like on the crazy drama claws? Ice will work also but of course the phone won’t make it. nail polish remover takes forever to dissolve and it will melt other plastic, not sure try it on foam cup or an old soda bottle and please don’t cap it! Would it be practical to de-solder the SIM holder and replace it + the SIM card? Probably not, but worth a mention. I have a small stick made of ocean spray that I’m quite fond of but has developed a crack from the top. I was wondering whether I could use the baking soda/superglue trick to fill in the crack so it doesn’t spread, or if superglue expands enough when it dries that it would only further widen the crack. What is Ocean spray, not familiar with the term other than the company that makes cranberry juice. I super glued my retainer over 4 months ago. So far it’s holding up very well. I have 2 fake teeth in my retainer so it’s in my mouth pretty much all the time. I take it out for meals and to brush. 4 months of being ~98 degrees and wet, I’d say super glue is decently water resistant. How long did you leave it to dry for? Could you use superglue to fill a crack in a clear dental plastic retainer? My girlfriend tried to glue here one or two tooth(s) back in when she was young! Gave her gum disease now she has a full set of dentures. Beware! I have a question, I use super glue sometimes in taxidermy and I’ve noticed that if I use it in a dome ( what I assume are the fumes) coat the glsss after a few hours. How long should I wait or how long could it take for the glue to stop fuming up the glass? Huh… That’s a good question. I have no idea! I was wondering. Does it matter the temperature you use super glue in? I’m trying to keep my tweaker in my truck in place. Well, apparently storing superglue in the freezer prevents polymerization, thereby extending the shelf life of an opened tube of glue. But that would mean it must be above freezing for a good bond to form. Never actually tried it in the cold myself, tho! I use super glue to harden Blue Tac (for military modelling construction perposes). Works very well but does give off some fumes. The question is are the fumes from both materials combined together toxic/dangerous. I used super glue to bond my galsses frame back together with the lens (on the frame not of the lens of course). Someone is telling me that it can melt in excessive sunlight and the “fumes” will get in my eye and cause damage. I don’t believe this to be true at all but I would like your insight. My glasses have been like this for months and I don’t feel any detriments. Also, I usually wait an hour or two until the glue is completely dry before I wear my glasses again. Thank you and hope to hear from you! Well, that’s the first I’ve heard of that one! AFAIK, once the glue has set, that’s it. Super glue in the eye is really bad and definitely a hospital visit they do have to freeze it with I think some liquid chemical and carefully pull it off in one piece! One girl I worked with had the glue facing her and squeezed to hard! Never point towards face and yes the fumes are dangerous read the back you guys! Well ventilated area only.